I did not know this existed. It is really expensive. It looks cool though. The stick looks like a gc one. It seems like it could be good if the stick doesn't wear out like the n64 original controller. Anyone happen to own this? It cost like 50 bucks so is kind of taking a big chance to buy it. sorry for such a late reply on this. it's an interesting controller. hori is supposed to make pretty good products so i bet this works well. looks kind of strange with the d-pad centered as it is but i'd pay about $30-35. if the analog stick is as reliable as the gamecube's, then i'd say it might even be worth $50 in the long run because we all know how the standard N64 joystick ends up over time - loose, squeaky and unresponsive. yea even at that high price it is tempting for that gc style joystick. But I am somewhat concerned that using that controller would make some n64 games way too easy since you wouldnt have to deal with the crap n64 joystick. i think the price is to high. i would want to buy 4 and these are not affordable enough to buy 4. for these that would be $200 bucks. there is no chance in hell that i would consider getting 4 of these. idk if i would even consider getting 1. for the price of one of these i could buy 4 used official controllers. 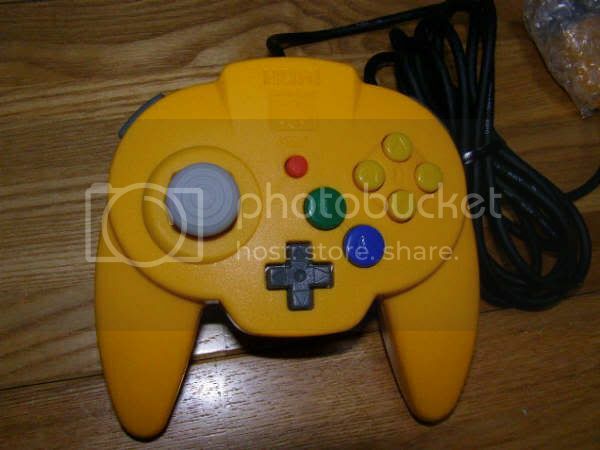 i just started getting back into N64 again, so i will be looking for a solution to the crappy control sticks on my old controllers. atm i'm thinking the best option is going to be to stock up on used official controllers. or to buy some replacement joy sticks off of the web. I inquired further about this controller on digitpress.com and someone linked me to this thread of a guys review of the controller. But still, I would still like to try one, but for 50-65 bucks for it I do not think I will get that chance. with countless other third party n64 controllers reviewed by people at that same site. It looks like 95 percent of them are just unusuable. That black 2 pronged superpad sounds like it might be worth trying out. How have I not heard of this yet?